We’ve written before about the difficulties many mainstream media entities have when it comes to adopting social-media tools like Twitter and engaging with their users. So there’s some good news in a new study of major media outlets by the Pew Research Center: namely, the fact that plenty of them have Twitter accounts. Unfortunately, it also shows that the main thing most of them do with those accounts — and the main thing most of their reporters also do — is simply broadcast links to their own content all day long. By doing so, unfortunately, they are missing out on many of the things that can make social media a powerful tool for journalism. The report was put together by the Pew Research Center’s Project for Excellence in Journalism along with George Washington University, and looked at 3,600 tweets from 13 of the country’s major newspapers, radio and TV stations sources over the course of a week. 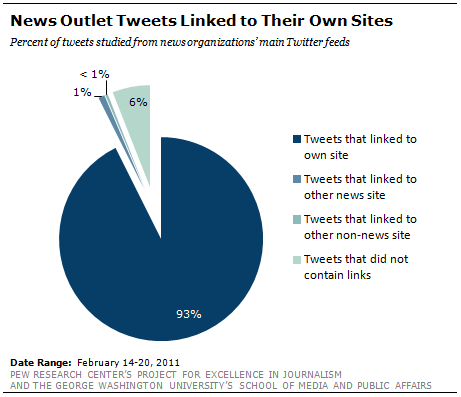 More than 90 percent of the tweets sent by the Twitter accounts for those organizations contained links to their own websites — only 6 percent of them contained links to a non-news related website, 1 percent linked to another news site, and less than 1 percent were without links. 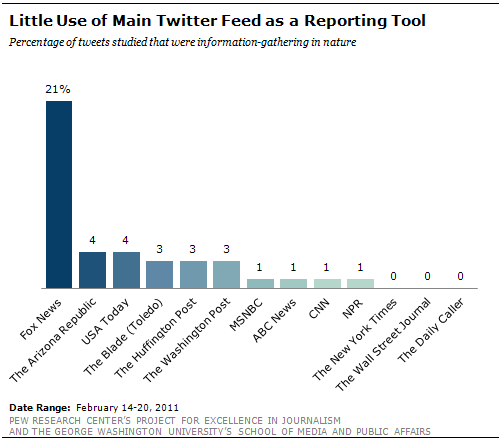 In other words, most are using their Twitter accounts as a glorified RSS feed, as Megan Garber noted at the Nieman Journalism Lab blog. I suspect this is because most media outlets have simply plugged an RSS feed or other automated process into their branded Twitter account, pumping links out and hoping to drive traffic to those stories. And the main reason many organizations do this is that it is easy to do and doesn’t require a staffer to handle, making it low cost in an era of declining employment in traditional media. Some news outlets are breaking with this tradition, however, including the New York Times — which has experimented with moving its feed from automated to “human curated” twice this year, and plans to do so again soon, according to a recent tweet from social-media editor Lexi Mainland. Obviously, not every news organization is going to feel comfortable linking to some other entity’s news website — although I and others have argued that doing this actually increases the trust that your readers or viewers have in you, rather than diminishing it. Although much of the news business is obsessed with “scoops,” the reality is that most readers just want information, and if someone else has it, it’s worth giving that link to them regardless of who it is. Steve Buttry of Journal-Register Co. has a great overview of how a media organization can use a Twitter account to both promote its own work but also contribute to the conversation around the news. But one of the biggest flaws in the behavior that the Pew report describes doesn’t have anything to do with links: it’s the fact that none of these major news outlets are using Twitter to ask their readers or viewers for help with news stories, or for their opinions about something the organization has done. As we’ve pointed out before at GigaOM, seeing the media relationship as a one-way street is not only short-sighted — because it deprives the organization of a rich source of feedback and tips — but could actually make the problems the media industry is experiencing worse instead of better. As the Pew report noted, only 2 percent of the tweets from major media accounts asked followers for information of some kind — either to help with a story or simply as feedback or opinion. Less than 1 percent of the tweets from the New York Times did this and just 3 percent from the Washington Post (surprisingly, even the social-media savvy Huffington Post did this in only 3 percent of its tweets). The number one outlet when it came to asking for input was Fox News, which did this in 20 percent of its posts to Twitter. One thing that could explain this disparity is that some newspapers and other media outlets prefer to let their individual editors and reporters — or in some cases, their social-media editors — do the outreach to their readers, instead of the main account for the organization. However, the Pew report also noted that very few of the top accounts for these media outlets (based on the number of followers) did this either. In some cases, that could be because the most-followed accounts are held by media celebrities who rarely engage with anyone, such as Rachel Maddow. But apart from the other factors that hold many outlets and individual journalists back when it comes to engaging with readers through social media — fear, a lack of time, a lack of knowledge about the benefits, etc. — some organizations have only themselves to blame, because their blinkered social-media policies handcuff most of their staff by preventing them from acting like human beings, as I have noted before and former Washington Post reporter Rob Pegoraro also discussed in a recent post. As a result, that two-way street still has plenty of one-way traffic on it, it seems. Media companies and Twitter â€” companies still mostly doing it wrong http://t.co/D3FVySpG ME: As mom always said, pointing is not polite. It’s been mentioned to me that there are those who believe as journalists not to seek popularity- however, I think in the online world, that’s really a moot point. It’s nice to know that GigaOm has already written about media companies having difficulty understanding social media use, and has already argued that linking to other news orgs can be beneficial, and already written that viewing social media as one-way is a mistake, and that policies can constrain staff members in using social media. Isn’t it a bit ironic for a post about how media companies are a bit too self-involved? Can the news exist without self-congratulation? Just wondering. Intriguing post, but with one fundamentally flawed premise — that Twitter encourages “conversations.” How often do you see one? Trending topics are invariably inane. When the topics aren’t inane, the contributors’ comments are, overwhelmingly so. 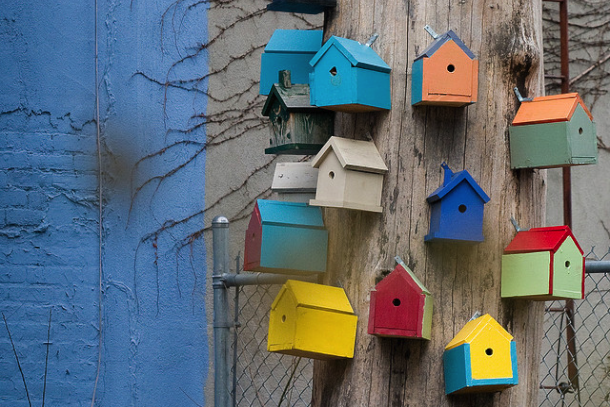 This is Twitter’s illusion: Only a tiny fraction of its users are conversing with it. The majority are like those folks who see a TV camera and start waving and making faces behind the folks being interviewed. They think Twitter gets them noticed, but really they’re just preening like apes in front of an audience that couldn’t care less. curious I don’t get what’s not to get here. this is what happens when entities get paid for the information they gather, why would a for profit entity not use Twitter to direct users to their content? Newspapers, media etc surely link to other resources, and commentary on their sites, but they get paid to drive traffic. On the issue of “contributing” to the conversation, perhaps you’d like to see editors, which is the job function within an independent media organization, extend their opinions on Twitter. Agreed. Perhaps a reporter covering a specific topic should moderate a Tweet Chat on topics. One that would be interesting is the Penn State developing story. Bob Costa’s interview was outstanding last night. But to expect media to not use Twitter as a traffic driver is an unrealistic expectation. I’d add most social media practitioners use Twitter to pimp their own content, and the larger their brand becomes the more they direct to their own content. This is a very well-written criticism of traditional mass media organizations’ inability to leverage social media such as Twitter. However, we should probably not be surprised at this because, after all, they are organizations that have grown up with the traditional mindset of what mass media was all about – one-way communication, no authenticity, no conversation etc. Social media practices are the very opposite – two-way or even multi-way communication, authenticity, collaboration etc. In fact I will be surprised if these organizations like NYT ever start using Twitter in the manner suggested in this article. Professor Clay Christensen (“Innovators’ Dilemma”) would probably refer to social media as a disruptive technology which will soon disrupt traditional media sources such as magazines, newspapers, TV. I am shocked! Shocked I tell you! Another reason why journalists may be not posting more than innocuous links to their own publications is that most publishers now monitor their staff’s social networking and you must a)Never say anything that may be construed as negative against your own brand; and b)Never promote the competition. If journalists started tweeting with links to opposition news sites, they would probably be in trouble with their bosses, even though, as this story says, it actually could promote readers’ trust. Most publishers (as in management) are very far behind what’s really happening through social media. As late as 2002, I worked at one top-selling Australian newspaper that refused to allow reporters access to the internet through their individual computers. Only section editors were allowed it. So in terms of company management, they are still very new to social media and rather suspicious of it. I agree that’s a big part of the problem, Caron — thanks for the comment. Yet another great post on a topical issue. I am surprised, though, you don’t talk about the shift in cultural mindset needed in corporations to effectively utilize this platform. Scalability is a big issue with SM – you need to involve EVERY employee (to various degrees), and have perhaps common-sense/tiered SM policy guidelines in place. Most corporations still want to control the “brand image”, and are still not totally in tune with what makes SM great. It needs to start with the C-suite, and percolate across the org. I have some additional thoughts on this on my blog. Feel free to take a peek. Thanks — I totally agree that a shift is required. That’s why I am so critical of the blinkered social-media policies that many companies, including media companies, choose to have.